By the 1940s, all natural existing elements had been discovered, but scientists worldwide still wondered how many new elements could be synthesised. By bombarding the nucleus of an existing element with more protons in a particle accelerator, new elements were synthesised and the periodic table began to fill rapidly. In 1947, it was decided that the team who discovered a new element would have the right to name it, but disputes were prevalent from the 1960s to the 1990s as an extension of the Cold War. This period is referred to by many chemists as the “Transfermium Wars” (‘trans’ meaning ‘after’, ‘fermium’ is the species with atomic number 100). Russian, American and German scientists all asserted that they were the first to isolate various elements from atomic number 104 to 109. 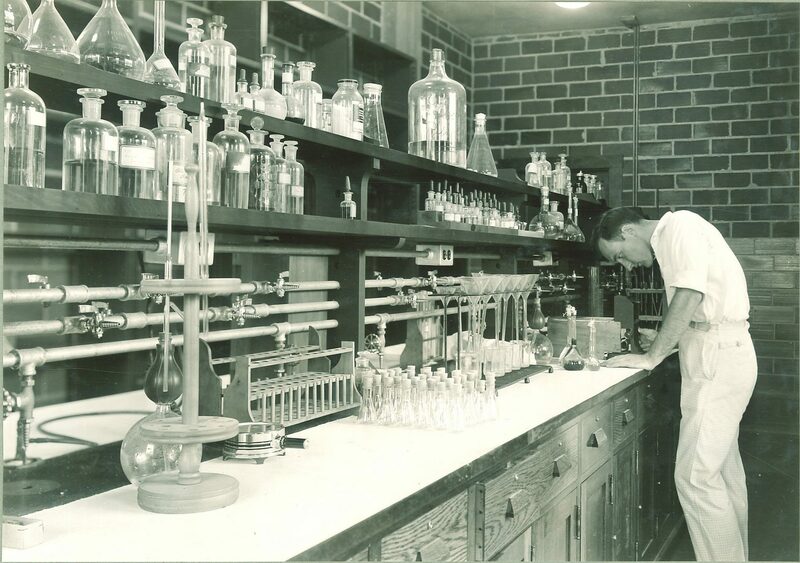 The long-standing quarrel was eventually concluded when IUPAC, founded in 1919, intervened. Elements 104 and 106 were named by the American scientists, 105 and 107 by the Russians and 108 and 109 by the Germans. After the stalemate, new rules were introduced in 2002. Currently, as well as historically, naming rights honour scientists or the location where they were first produced. Recently, the existence of four new superheavy elements was confirmed by IUPAC but these were originally synthesised a few years before by American, Japanese and Russian scientists. Their discovery was announced in January 2016, but their official names were only confirmed in November 2016. 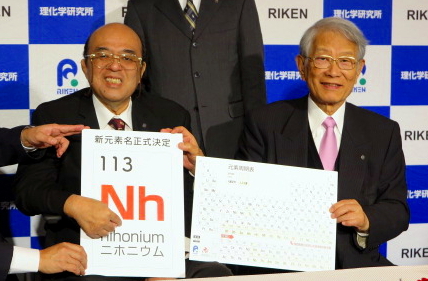 The elements with proton numbers 113, 115, 117 and 118 were named Nihonium (Nh), Moscovium (Mc), Tennessine (Ts) and Oganesson (Og) respectively. Nihonium was named in honour of the Japanese researchers who synthesised it. Oganesson was named after the Russian scientist Yuri Oganessian, a scientist at the forefront of superheavy element research. Tennessine and Moscovium were named after Tennessee and Moscow respectively. Moscovium was actually first produced back in 2003 in Russia by a team lead by Oganessian. However, it was only formally acknowledged by IUPAC and IUPAP when researchers in Germany in 2013 and the USA in 2015 confirmed the findings of the original Russian experiment. Naming rights were consequently given to the Russian scientists. In fact, an experiment in which Tenessine-293 and Tenessine-294 produced Moscovium-289 and Mmoscovium-290 via alpha decay contributed to its confirmation as a new element. It turned out that the properties of Moscovium from this experiment matched those of Moscovium which had been synthesised from scratch in another experiment. A significant problem concerning the process of synthesising new, superheavy elements is that the few atoms which can be produced are unstable and thus short-lived, which makes their isolation and identification a very challenging task. The process is lengthy and expensive, and therefore it is no wonder that only a small number of laboratories worldwide are invested in this line of work. After eventually synthesising the element, researchers are then faced with acquiring approval from IUPAC as well as IUPAP, the International Union of Pure and Applied Physics. Owing to the fact that all four of the elements are superheavy, their half-lives – the time taken for the atom to degrade to half of its original value – are short; Nihonium-298, the most stable isotope (atomic mass number 298) has a half-life of just twenty seconds. Nihonium is radioactive and has five other isotopes, all of which are more short-lived than Nihonium-298. Moscovium, produced when Americium (atomic number 90) collides with calcium, undergoes radioactive alpha-decay to Nihonium, which then decays to 109, 107, 105, 103 and eventually to 101—Mendelevium. Oganesson, also a highly radioactive metal, has a half-life of about 0.9 seconds, which highlights the immense effort required to correctly identify the unknown, never-before-seen element. As of yet, these elements have no uses and our understanding of them is limited. However, further research may unlock their potential and each could have numerous practical applications: previously discovered superheavy elements have found utility not only in the laboratory, but also in the home. Perhaps more significantly, however, their mere discovery displays an acute ingenuity and perfectly describes the ever-evolving scientific research which can been seen in many industries. These superheavy elements are thus the poster-children for testing the boundaries of modern-day science.